Come tax time, most business owners have their CPA on speed dial. But here’s a question. How often do you seek your accountant’s advice on other areas of your food truck business? Accountants are awesome financial advisors who can help you with more than just filing tax returns. The start of the year is the perfect time for planning your business future. Schedule time now with your accountant to discuss these accounting topics over the next 12 months that will most likely impact you financially. Here are five key accounting topics that should be part of that dialogue. Expanding operations into new locations. Adding or making changes in staffing. Merging with or acquiring other food businesses. 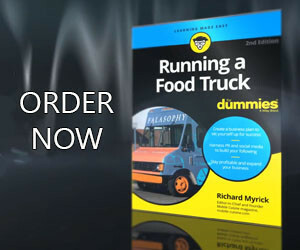 Positioning your food truck business for sale. Strategic ways to improve cash flow. Getting up-to-date on retirement planning and wealth management. Any major investments, gifting or charitable giving planned. Capital investment, equity financing or bank loans in the works. Ask if all insurance policies up to date? Look to see if stringent compliance, security and privacy standards being met. Find out if your food truck is protected against fraud? Determine what internal controls are in place to protect the food truck business? Restocking and ordering processes are maximizing cash flow. Unsold or wasted inventory is properly accounted for on the balance sheet. Determine if sales tax is being collected in every municipality you operate. The final accounting topic to discuss with a professional relates to tax compliance. Remember that state taxes can be just as tough on your staff’s time as federal taxes. Are you confident that you have adequate processes in place to comply with regulations? Discuss any new tax laws with your accountant that could affect your food truck. Also determine how you can implement changes to address them. Collect and file W2s and 1099s for any contract staff. Ensure exemption certifications are collected and stored properly. Update their taxability practices to comply with any online sales you make. Conduct an internal review to look for any red flags that could trigger a sales tax audit. Now is also a great time to reinforce a few best practices. Keep business and personal finances separate and to ensure all transactional records are complete, organized and easy to access. Automate any manual processes to save time and money and reduce risk. The sooner you get started on long-term financial planning and compliance, the sooner you will start seeing bottom line results.